Me and Dave have already attempted Pillar but failed when we never planned to walk from Ennerdale, we thought you could get further along in car which delayed and then we had probs on way, it was never meant to be that day, however a week off work and I was determined that I would be back there and get it done. As always keeping an eye on the weather is always a good place to start when planning a wild camp I use multiple sites and with a bit of common knowledge and lots of guess work, I work out when is going to be best to go. The weather had been brill over the weekend following people on twitter and getting live pictures of the snow and clear summits was another good way of helping to decide. All the forecasts I had been looking at, said that weather would be turning on Tuesday, rain and winds to gales over tops. 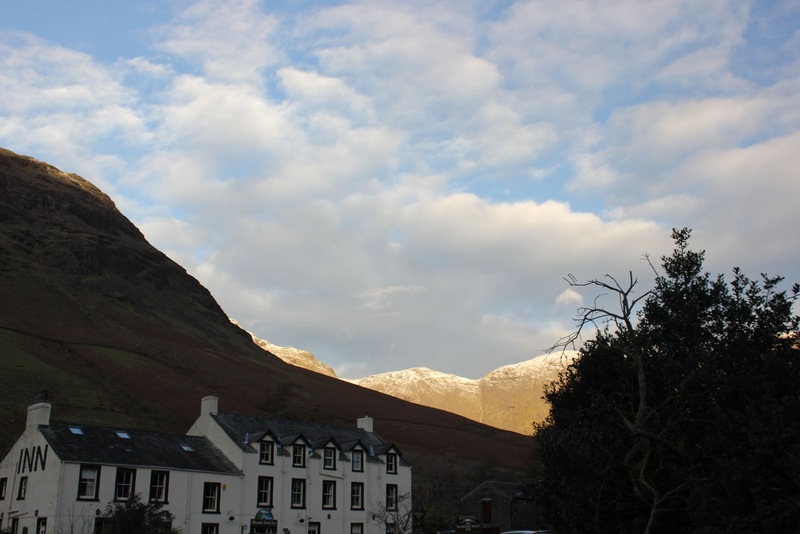 As I have my Daughter on a weekend, I cannot get away then so missed the good weather then and Monday was the only day left, so plan A was to head up to Wasdale on Sunday after 6pm when I drop my Daughter off. Still needing to pack everything into my bag (a rush as always). I hurried back at 6pm and the stress kicked in. Trying to think what you need and I would take 3 days worth of food as if weather wasn't as bad as forecast (lets face it they get it wrong alot) then I could stop there for 3 nights. All packed up it was after 7pm before I left, I've had cold (man flu) since end of last week and was really tired so needless to say the 3 hour drive over to Wasdale was going to be a killer, that it certainly was night time driving when your shattered is dangerous and not encourage on this web site, I struggled badly to keep my eyes open. I made it and wasted no time to get camp set up at the barn campsite which now you pay for at the hotel reception. I took some beers up just in case pub was shut and low and behold I arrived at 10:32pm it shut 10:30pm, so I cracked open a can and took some pictures of stars the sky was full of them, it was cold but not as cold as back home had been. After about half an hour I shut the tent up and got my sleeping bag out, I had rented a film from Google and downloaded it on my phone Apartment 143. Not going to far in detail but I really enjoyed it a horror, if you like paranormal activity this is way better in my eyes anyway, so film on and can in hand I relaxed headphones on. I'm sure it was after 1am before I went to sleep, I had only drank three quarters of my can, my cold wouldn't allow me to drink anymore coughing all the time, cold can, cold air wasn't helping. I was up sharp about 7am I just lay there for a while relaxing with my thoughts, until I could be bothered to get up and cook myself a bacon sarnie. I packed up after my sandwich and filming, I headed over to reception where I payed for my camp five pounds not bad they gave me a code for the toilet, which was clean with shower mind the shower is a pound for six minutes. I left all my food in my bag about 9 bags of look what we found, which was my mistake of the trip, I should have packed for the 1 night and lightened my load, fitness and having a cold going on a 4 mile hike with a bag weighing more than 20kgs wasn't good. I set off about 9:30am and with a nice steady pace walked up towards Pillar taking pictures and capturing the sights with video. 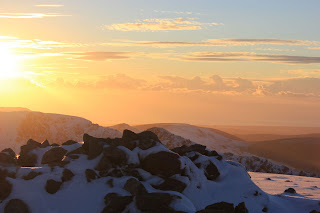 I had on my t-shirt and micro fleece and it was the sun beaming down nearly on a perfect clear sky it was warm and it would get warmer, it felt like a summers day as I walked up Pillar, I couldn't believe the heat. I filled my travel tap with lovely clear cold water and it was a joy to feel the cold water going down to cool me off, a brand and coke with ice would have been better but I probably wouldn't have made it up lol. At the beginning of the walk 4 blokes walked past me and that was all I would see until I reached the summit. I goto the top of Black Sail Pass and the snow was quite deep few inches in places. The walk from here would be a hard slog with my unfit hill self a cold on board and a bloody big horrible rucksack to carry up full of unnecessary food. 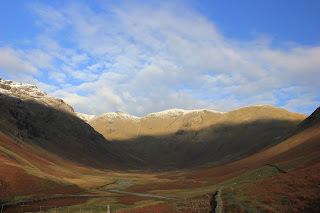 It took me 5hours and 20 mins to reach the top which was 4 miles from my camp at Wasdale. I came across a little scrambling part which Adrian told me about, it broke the slog up and I had fun scrambling up it. I got to the summit after many stops and my dinner of chicken casserole. My legs were goosed a good training session would be an understatement on how they felt, my left leg I must have pulled as the snow drifts was as deep as about a foot and a half in places which when you stepped on the snow you never expected to fall into it. I headed for the cairn and tossed my bag off my shoulders which by now were also killing me, I was in a right mess lol but the views were breathe taking, I sat there for quite sometime until A nice gentleman came walking up from Ennerdale, we had a brief chat and I told him about my vids on YouTube, he told me to look out for him commenting and my horrendous memory has forgot his name, hopefully he will read this and comment and put me right on that. It was getting late and he headed down I began to pitch my tent making sure it was well pegged down, I was expecting gales, as I was putting the last pegs in another bloke came wandering on the summit waving, at first I thought its Chris as I was meeting him later that afternoon on the summit. I noticed he had no bag on as he got closer I saw it wasn't Chris, again a brief chat this time caught on camera which is in the video I made (below), he was a funny lad coming up with just tracky bottoms and a big coat, with only an ipod for company, he was from Ennerdale, lucky bugger. I wandered around the summit taking pictures and just staring at the surrounding views, it was amazing I was in total peace a slight breeze, I looked out for Chris and caught glimpse of him on his way up. When Chris got to the top he too was fookt, he had down it in 2 and a half hours, I helped him get his tent up he wanted a cuppa and something to eat, we both retired to the tents for food and drink mine being a brandy, I went to turn on my head torch to be greeted with nothing, I thought at first it was batteries but nope it must be the bulb without light I downloaded a torch for my phone, brilliant I had light again. We stood outside chatting having a laugh as we do but after a while the fog came in so after me forcing a bit of brandy then dram on to Chris we retired and I was out like a light for around 10:30pm the earliest I've ever been asleep to be honest its usually 12-1am on any given day. Morning came at 4:30am call of nature so a quick piss in my nalogen bottle and a look outside to see the fog and back to sleep I went, I woke up to stop up at around 7am and lay there with a bit music relaxing, my morning as always starts with a bacon sarnie and it was such a pleasure to have along with my orange juice. It started to rain and winds had been blowing quite high from 4:30am, the Hilleberg Soulo never moved this tent is a keeper for solo trips for sure. The rain had been stopped for half hour or so and we made the dash for it, we got top covers off and maybe 1 peg out before it started again and it didn't let up for the 2 and a bit hours it took for us to get down. You probably thinking that it took a long time to get down my left leg I had defo pulled a muscle or something and it was go slow with stops for me with Chris waiting for me. Once down Chris headed for the pub to sort out his things and I to my car for my dry clothes changed and into pub for chips and a pepsi we reflected on the trip, another good one with a few lessons learnt. A full set of pictures you can find here and the video below please sub and like, leave a comment and let me know what you thought of the trip/views etc. any questions please feel free I will be more than happy to help if I can, I am no expert but if I have the answer to the question I will be happy to answer thanks for your time, I hope you enjoyed the post. Great account Mate of your Pillar trip,I went up Broad Crag & Ill crag on the same day,like you say the warmth in the Sun with the snow made it magical. Excellent report Paul. Looks like you picked the right day. Great pictures and stunning views. Can you tell me what clothing you wear on a winter wild camp, waterproofs thermals etc. Do you take any spare clothing or does that just add to your pack weight too much? Thanks for the advice Paul. I'd forgot I'd posted that comment back in November. Just saw it again as I was noseying through your blog..lol. Hoping to get some serious wild camping done this year so I may be picking your brains again for some good tips! Take care Bud. 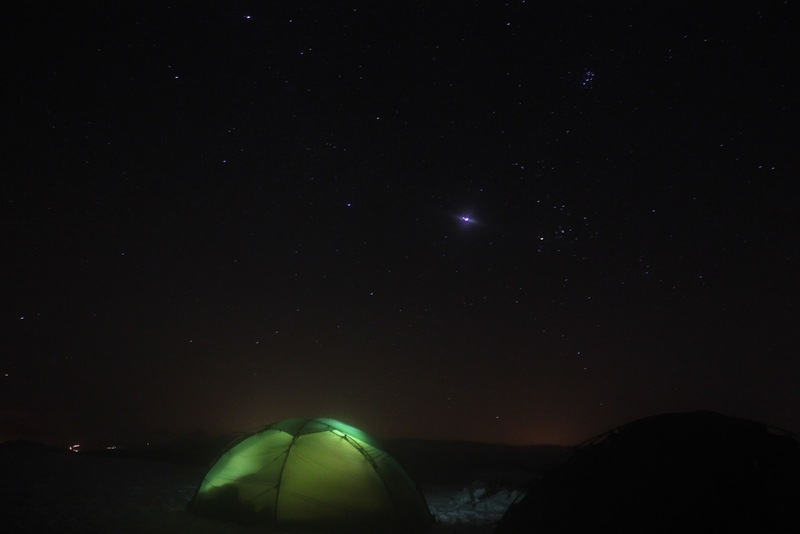 Another great trip report, I love you guys with your summit pitch,what great views to wake up with. 9 bags of LWWF you should open mobile cafe for the lone walkers. LOL. I really want to make a summit pitch in the snow this year, so you and your bacon sarnies are providing good insperation. Man, I don't know how you do it. If I had to pack with such little time, I'd never make it! It takes me days to even write my list of everything I may need...and typically I'm not dealing w/ snowfall. Good job to you!